This page launches a new aim for the AmigaPd website which is to help locate and preserve Amiga public domain / shareware games previously feared loss. Below are the first three games which are on our missing list. If you have a disk containing the missing game then please use our contact form to discuss the best way to submit the game. Og! 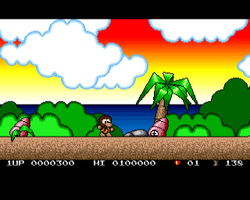 The AGA version is missing - this is a screenshot of the A500 version. Dave Parsons has kindly made all his former Sareware and Licenceware games available as freeware. Unfortunately he no longer has the AGA version of Og! Read the interview with Dave Parsons for more information. This is not the Jeff Minter version but a version made by the creators of Electrek Chris and Wilf which was to be released as shareware / public domain until Jeff Minter intervened. Read the interview with game tester Andrew Haywood for more information. The full registered version of the Commodore Amiga A1200 Shareware game called "Scavenge" written by James A.Wright in 1995. There is a facebook page dedicated to the location of this game.